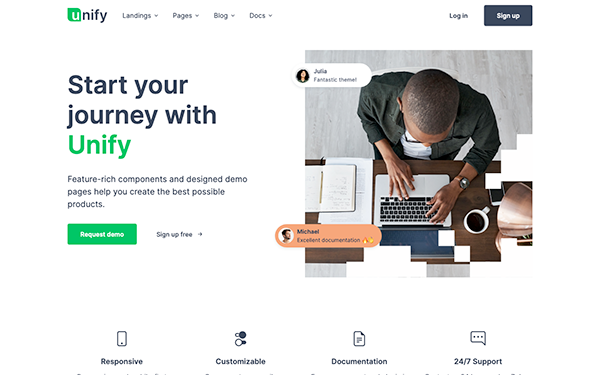 The best responsive bootstrap template is Unify. The template is compatible with all main browsers. The version running now is V1.3 and further versions are also coming up with several other super features. A single time purchase of this template is enough to download the updates happening in future. The template is very friendly for the developer. The code can be customized very easily according to developer’s requirements. PayPal account in which 16 dollars is sufficient to buy this template. One of the breakthroughs in bootstrap templates is Unify. A preview of the template is also provided under live preview button. Any user can check the preview and then buy the template. An excellent template with excellent features which is the hot cake of most of the bootstrap templates. The layout and design is so nice that any developer loves to use the template again and again. The template updates are also posted on twitter. One can follow on twitter to know the latest happenings. Purchase basket is visible on the right hand side top which shows the total number of purchases of this product. An option to share the template on social networking sites like Facebook and twitter is also available on the website. License details are also available on the website so that any person can know the conditions pertaining to license. The pages of the template, features of the template and the expected features in coming releases are also given on the website. Whatever changes are made on the website are displayed as log and they are termed according to the changes. If it is a new change, it is tagged as NEW under logs section. If it is an update, it is tagged as UPDATED under logs section. If it is an improvement, it is tagged as IMPROVEMENT under logs section. If some fixed changes are included, the changes are tagged as FIXED.